Throw in some bright sunlight and it's so pretty! I loved this mani under very bright light. My indoor/artificial light photos were really not doing this gradient justice, but some sunlight streaming through bf's huge bedroom window prompted me to take a few quick photos. It was unplanned and a few days after doing it, hence the tipwear. 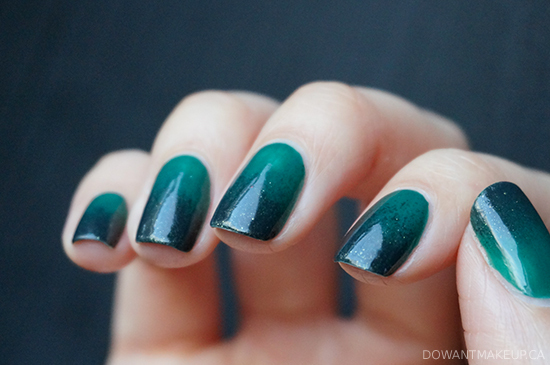 Both greens come off a little blue in the natural light photos; in reality they are very much deep, true greens and the mani overall is quite dark like the first image. The gradient was created very simply by dabbing Live and Let Die on a base of Going Incognito with a makeup sponge. 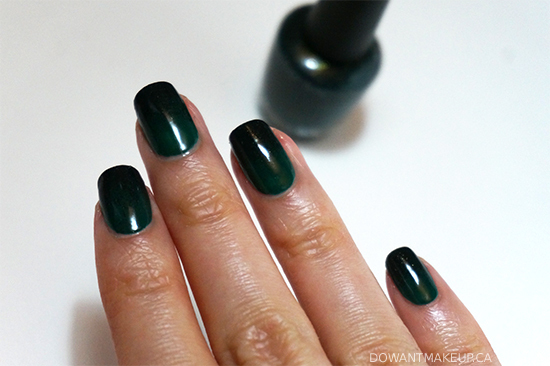 Have you ever tried a gradient nail before? What's your favourite way to create it?